You guys are so nice. I can’t even being to tell you how much I appreciate all your nice comments about my senior cat. I love you guys! This weekend I spent a lot of time cuddling and loving on my cat. I also did some retail therapy, which included some handmade shoes and amazing new plates to add to my collection. I also spent a lot of time watching master chef and repeating the cute little kid at the end that says “one potato two potato.” So that was fun. I also went to the farmers market and bought too much stuff like I do every weekend. I always think I will eat more than I actually do. My eyes are way bigger than my stomach apparently. 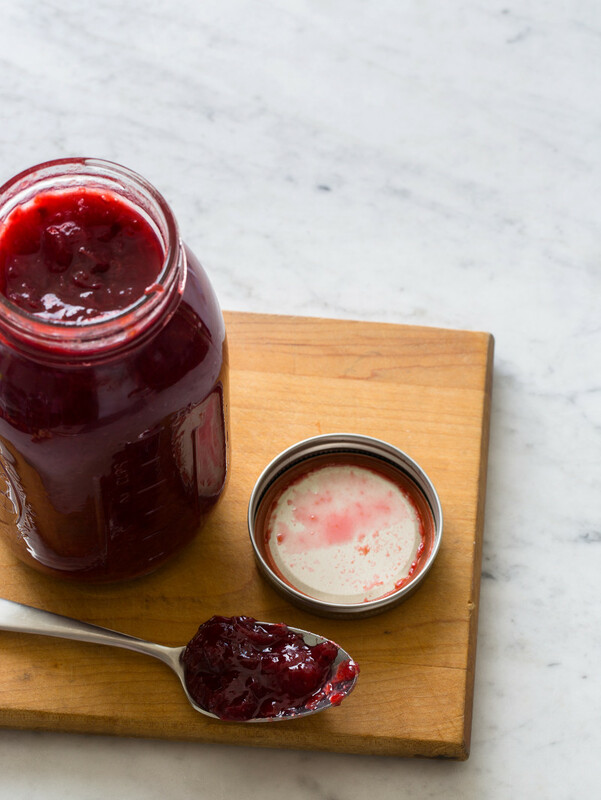 I hate wasting food, which is why we made this simple little recipe from Black Plum Preserves. Two ingredients, no pectin, and lots of deliciousness. We are probably going to post another recipe using this Black Plum Preserves. Yum. I also wanted to share this BEAUTIFUL knife New West Knife Works gave us. I was the one who got to take it home (yay me!) because all my knifes are old and have never been sharpened. New knifes are mind blowing when you have been cutting dull ones. This knife is like something I have always wanted, a mini kitchen light saber. Bonus: they are all sustainable and made in the USA. So that’s pretty neat. 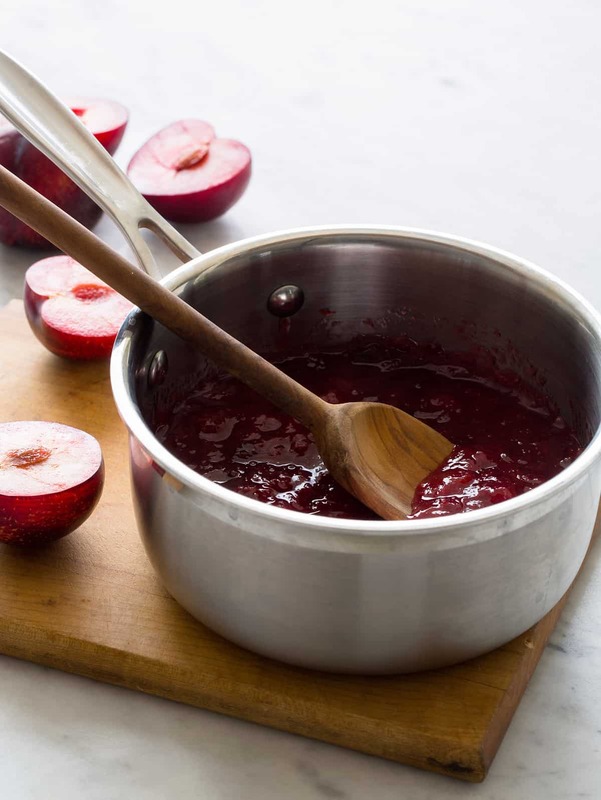 Hope you all had a great weekend, and enjoy this Black Plum Preserves recipe! 1. Place plums into a large pot. Sprinkle sugar over plums and toss together. 2. Allow mixture to sit for about 1 hour, to allow the juices to release. 3. Place pot over medium-high heat and bring to a boil. 4. Lower heat to medium-low and allow mixture to simmer for 1 hour, stirring occasionally. 5. Remove from heat and allow to cool for 30 to 45 minutes. 6. Repeat steps 3 through 5 two more times. 7. Allow mixture to cool before pouring into sterilized jars and canning. Wow so easy! I might have to give my plums new life in this recipe. A little TLC once in while is good for the soul just like making preserves! Wow, no gelatin needed! Easy. I’ve made jams with a bit of apples in it because it has natural pectin-like qualities. Looks great! I have plums…can I add vanilla paste as well? you are going to love their knife…i have used them for 9 years or so…i have many..if you cook alot…get the little one for root veggies…i just got back from the store and i’m gonna make plum jam tomorrow….thanks for your great blog….you have a great eye and heart in what you do…..
What a gorgeous soft set preserve. Plum jam is one of my favourites. I made my first batch! Delish! I lvoe it, not too sweet. I added about 2T of Grand Mariner and 1T ov vanilla bean paste. Cheers to you for this recipe! Any more jams that don’t require pectin? I’d love it! I plan to stock my pantry with these holiday gifts, adn the fall temps mean simmering for hours on the stove is actually a pleasure. Thanks so much! Yay, so glad you like it! Gooseberries, quince and red currants are all high pectin fruits, so require no additional help…you can also use these fruits in combination with a low pectin fruit, i.e., strawberries, raspberries and still be able to get away with not having to use store bought pectin/gelatin. Good luck! 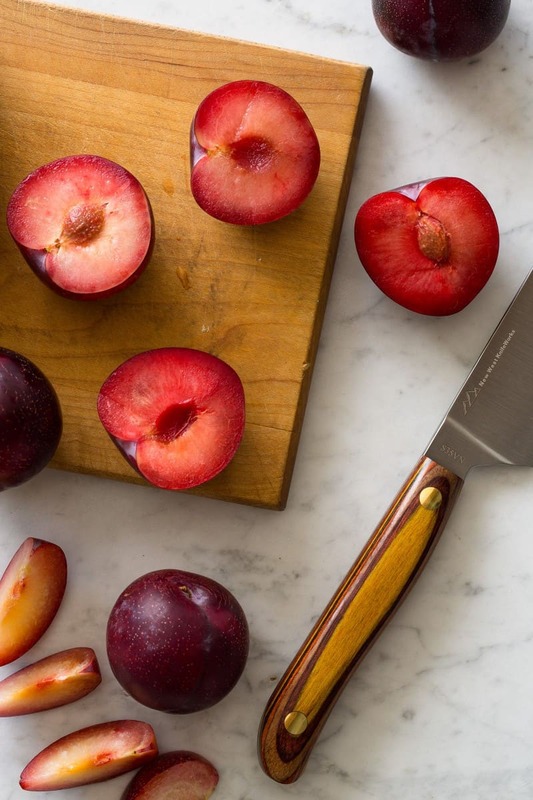 Can I use peeled plums in this recipe? Definitely! you can also chop up your fruit more for a more “jammy” texture…or leave them quartered for a chunkier (preserve) consistency! Thanks so much! Making mine today! Plum jam is probably my favorite jam ever. I especially love it when made with sour plums. YUM! I’m going to try this tonight. I think you just saved me from eating an entire bag of plums all at once! This’ll force me to pace myself. Mostly. Sounds good and it’s plumseason. So you don’t peel the fruit or put it through a food mill? what happens to the skins? Not too tough textured or is that why you cook it down three times? We have a few of their knives and LOVE them. They are also super nice if you ever have a chance to stop in and chat with them in Jackson Hole.